suppose, I grew to love him, too. What's not to love about a man who plays mostly honorable characters with sly humor and wit? 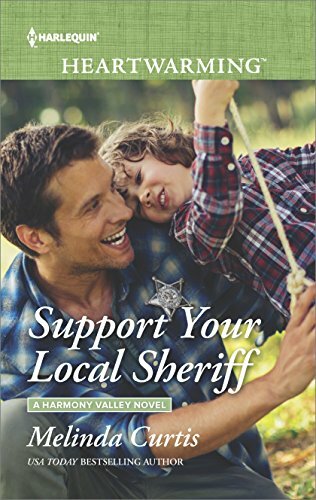 So, when it came time to give the small town sheriff in my Harmony Valley series his own happily-ever-after, I submitted the proposal to Harlequin titled Support Your Local Sheriff. I didn't expect the title to make it past marketing to the cover, but it did! Now, lest you think my book is a historical romance set in the old west...Let me reassure you that this is a contemporary romance. However, my hero, Nate Landry, does share qualities with James Garner. They both have a dry sense of humor. They both worked in law enforcement (at least Mr. Garner did on-screen). They were both men of few words and made women's hearts swoon. My small town sheriff has a few characteristics that make him unique. He jilted his fiancee on her wedding day (with regrets). He inherited a pink wedding dress from one of the town residents (yes, pink!). And he is determined never to have kids, which makes the appearance of his toddler son in Harmony Valley (named Duke! another ode to fav movies of the past) a tremendous surprise. Besides becoming a father, what Sheriff Nate doesn't expect is a sudden election or that the woman he loves will run against him! Tipping my hat to James Garner style heroes and on-screen roles. Melinda Curtis is an award-winning USA Today bestseller. She writes sweet romances for Harlequin Heartwarming, sweet romantic comedies and sexier traditional romances. Support Your Local Sheriff is a Harlequin release and currently on pre-order (available in September to Harlequin Reader Club members and on October 3rd everywhere else). I love the title and your plot is so interesting. Definitely can't wait to read this one!